A Previously well 29 year old male awoke at 0630hrs unable to move his torso or limbs. His initial complete paralysis had lessened somewhat after 2 hrs and he had managed to reach the phone and call for help. He had experienced a similar episode 2 weeks before that had self-resolved in about 30 mins and thus, had not sought any medical opinion. He worked as a cook and had eaten a large pizza for dinner late the previous evening. He took no regular therapeutic or recreational drugs. He had no significant medical history. His examination was notable for a 0-1/5 power in his limbs, totally absent reflexes in his limbs and abdominal muscles. He had normal cranial nerve exam and a GCS 15/15. He was understandably anxious. His ECG demonstrated a sinus tachycardia, prolonged PR, ST depression with prolonged QU interval. Likely to represent severe hypokalaemia. Of note is the raised blood sugar and otherwise normal electrolytes. 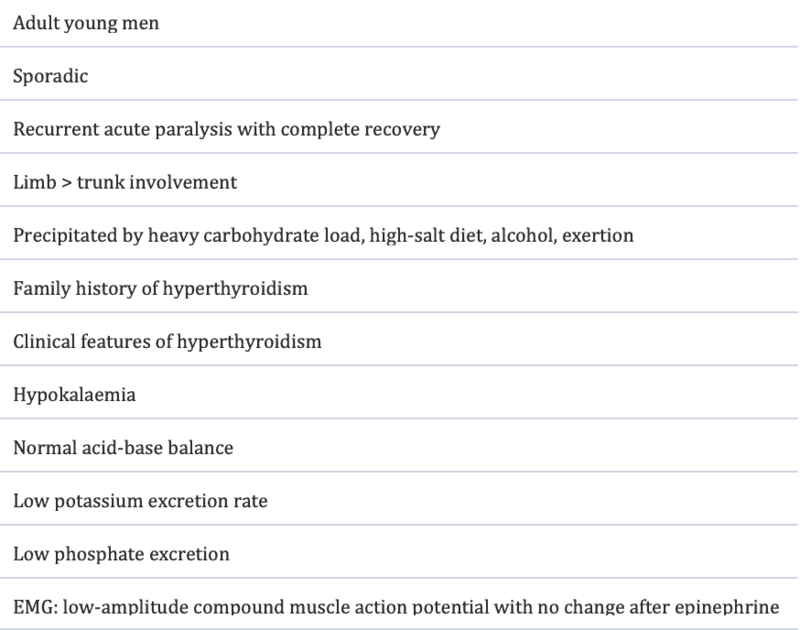 His formal electrolytes confirmed the hypokalaemia at 1.2mmol/L with a critically low magnesium and phosphate. His thyroid function was sent urgently and revealed low TSH and very raised T4. He was diagnosed with thyrotoxic hypokalaemic periodic paralysis. Thyrotoxic hypokalaemic periodic paralysis (THPP) is a rare complication of hyperthyroid disease. It is more common in patients of Asian descent but is being more widely recognised in the Caucasian population. Despite the majority of thyrotoxic patients being female the preponderance of THPP patients are male (20:1 ratio). Most patients present late at night or early in the morning following a heavy carbohydrate meal. The condition was originally described as nocturnal paralysis or night palsy. 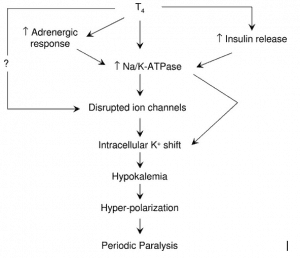 The male preponderance thought to be due to the effects of testosterone on the upregulation of Na/K ATPase channels in skeletal muscles. The presence of hyperglycaemia in this case may represent undiagnosed type II diabetes which would further exaggerate the hyperinsulinaemia due to tissue resistance to insulin. 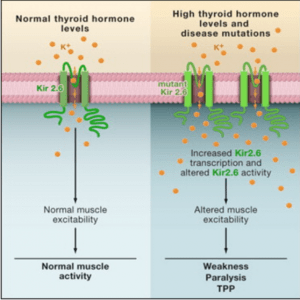 A mutation in the Kir2.6 potassium channel leading to increased sensitivity to thyroxine dependent up-regulation has been implicated in the disease aetiology. All these factors seem to have aligned in this case to lead to hypokalaemic paralysis. The pathophysiology of the disease means that the total body potassium is normal in these patients, it is just intracellular. Aggressive IV potassium replacement may lead to a rebound and possibly life threatening hyperkalaemia. Conversely aggressive treatment of possibly hypokalaemic arrythmias may be required. In this case the patient was given a reasonably aggressive regime of IV potassium, magnesium and phosphate replacement and oral propranolol to block the beta dependent Na/K ATPase pump. His initial electrolytes remained static with little improvement of biochemistry or symptoms for the first 3 hours until the beta blockade had effect. The patient then rapidly corrected his potassium, overshot slightly to a maximum potassium of 6.2 and then settled to a normokalaemic level. His symptoms resolved with his potassium. He was monitored in ICU before being referred to an endocrinologist for further investigation and treatment of his thyroid disease and possible diabetes.